There’s no rulebook for what people find appealing in a partner. Everyone has their own taste, but over the years, scientific studies have suggested certain traits are more desirable than others. And it’s not just the types of traits we’d expect—fit bodies and a perfect smile aren’t the only things people find attractive in their partners. Here are eight traits people find attractive, according to science. According to one study, women are more attracted to partners with a good sense of humor. One researcher theorizes that this has to do with a sense of humor being an indication of higher intelligence. Since these are inheritable traits, women may be genetically predisposed to seek these qualities out and pass them on to their offspring. The same study indicated that while men list a sense of humor as important, they don’t see funnier people as more desirable overall. According to one study, women with high-pitched voices give off the impression of youth and even appear thinner to men, increasing their attraction to them. The same study also showed that men with a deeper voice appeared more masculine and attractive to women, with the women associating those baritone vocals with higher testosterone. 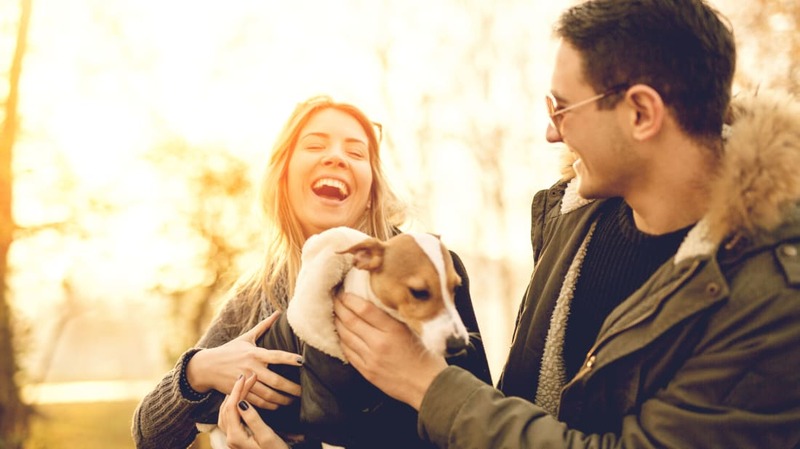 We’ve all heard anecdotes that people with pets seem more attractive than those without, but one study sought to find proof. In the study, a subject was asked to approach 240 women and ask for their number—but half the time he would be accompanied by a dog, and half the time he’d be alone. When he was with the dog, he got three times as many numbers as he did without it. This is just one of many, many studies and surveys connecting pet ownership with attractiveness, so you might want to thank Fido with an extra few treats next time he’s begging at the table. Good news for guys who forgot to shave the past few mornings: One study of 8520 women showed that they viewed heavy stubble as the most attractive when compared to clean-shaven or heavily bearded men. In particular, these men were viewed as most attractive for short-term relationships. There’s good news for men with thicker beards, too, as they got higher ratings for potential long-term relationships. In conclusion: Put the razor down and see where your love life takes you. One study from 2014 showed that people look more attractive when they’re seen socializing in a group. Though there are only theories as to why this happens, the study’s author gave a convincing explanation: It likely has to do with our brains scanning the faces of all the people in the group and finding an “average attractiveness” among the combined members. According to the author, that means that, taken as individuals, people might not be found as attractive as they are when in a group. This is because each member’s face tends to be skewed towards the overall “average attractiveness” of the combined members. The study found similar results in groups of all men, all women, and a mix of both. A study concluded that what our parents have been telling us for years was right: Just be nice! The study included three groups of people—120 in all, made up of males and females—rating the attractiveness of pictures of 60 strangers with neutral facial expressions. Weeks later, the same people saw the same pictures, though the researchers changed the groups up a bit: One group would read positive attributes written about each person in the picture, and another group would see negative ones. Then there was a control group that, again, had no attributes accompanying the pictures. During the initial round when none of the groups saw any personality descriptions, there was a similar consensus over which subjects were most attractive. But when the negative/positive character traits were introduced, that changed. As you’d guess, people were more drawn to the subjects with nicer descriptions and reported feeling more turned off by the negative ones. Being nice is its own reward, but it could also help you land a date! Even if you don’t have a flawless physique or fancy car, you may be attractive to potential partners if you have a handle on your financial future. According to a study conducted by Discover and Match Media Group, 69 percent of the 2000 people questioned find financial responsibility to be either very or extremely important when choosing a partner to date, placing it ahead of sense of humor and physical attractiveness. Working on firming up your six-pack? You might be better off sharpening your credit score. Being financially responsible can be tricky to quantify, but that same study found something a bit more concrete in terms of attractiveness: It was found that 58 percent of online daters place a good credit score as more attractive than a fancy car, 50 percent placed it over a fancy job title, and 50 percent of women find a good credit score more attractive than a physically fit body. Many find a good credit score attractive, so it pays to keep an eye on yours. Discover offers a Free Credit Scorecard, and checking it won't impact your score. It's totally free, even if you aren't a Discover customer. Check yours in seconds. Terms apply. Visit Discover to learn more.